Exiland Backup Professional is a full featured edition. 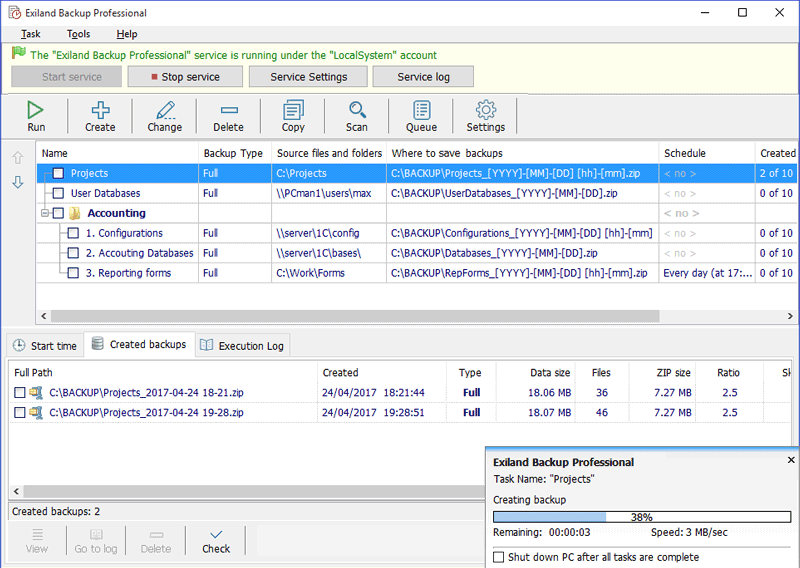 It includes all the features of Standard edition and additionally allows you to back up files from multiple PCs on a local network using the specified accounts (logins and passwords), and save backups to any storage locations: local or network drives, FTP/SFTP servers, removable media (such as external HDD or flash drives). Professional edition runs as a Windows service in background without interfering with other programs. Exiland Backup saves your disk space by compressing the files included in backups. It is perfectly suited for backing up the data in a local network: work documents, database files, websites, user profiles, and so forth. You can download a demo version of Exiland Backup to try out before you decide on buying. - Supports VSS (Volume Shadow Copy) to back up open files: MS Outlook (*.pst,*.ost), etc. Recent Changes: Analyzing ExitCode (ReturnCode) after running external applications was added; Global file masks editor; User interface was Improved; Some bugs and defects are fixed.